Need the Perfect Gift? 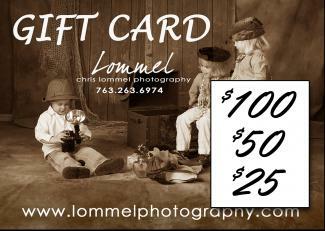 Give a Lommel Photography Gift Card. Nothing can be more personal than giving someone a chance to preserve memories in the lives of their newborn baby, children, family or high school senior. A professional portrait gift card is the first step in giving a gift that can be cherished for a lifetime. Gift Cards remain the most requested holiday item, according to the Natiional Federation of Retailers. We often hear parents suggest their children give them a portrait gift card for the holidays or other special occasions like their anniversary. With each Gift Card purchase we provide a gift box filled with helpful tips to create the perfect portrait. We also offer a free portrait consultation. SPECIAL OFFER: For every $100 in Gift Card purchases before Dec. 20, receive an additional $10 on the card, or take it on gift card for yourself!